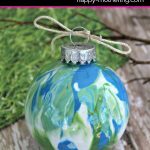 Are you looking for DIY Christmas ornaments you can make with supplies you already have? This DIY Twine Wreath Christmas ornament is simple, yet elegant! And you probably already have most of the supplies. Every year, I like to add a few new homemade Christmas ornaments to our collection. This Twine Wreath Christmas Ornament is a super easy one to make, especially if you have crafting materials around the house already. All you need is a mason jar ring (I have boxes of those! ), some hemp twine (so great for so many things), Christmas confetti, ribbon, scissors and a hot glue gun. The kids can definitely help put this Twine Wreath Christmas Ornament together, but you’ll want to supervise them with the hot glue gun. Wrapping the twine is great for finger dexterity! Or you can use this fun crafting activity as a little bit of “me time.” If you’re like most moms, you can use a few minutes to yourself. Crafting is one of my favorite things to do alone because as the creativity flows, my mind and body relax. Either way, you’re going to love the results of this simple DIY Twine Wreath Christmas Ornament! Cut your hemp twine down into 24″ inch pieces. Hot glue an end piece of twine inside the mason jar ring and begin tightly wrapping the hemp around the lid ring until you reach the end of your twine, then glue the end inside the mason jar ring like you did to start your ornament. Keep gluing and wrapping the hemp twine until you reach where you started, making sure the whole mason jar ring is covered in twine. Now cut an 8″ piece of 5/8″ ribbon, loop it around your lid ring, and tie the ends together in a knot. Hot glue your holly confetti or a tiny Christmas decoration onto the bottom left of your ornament. Hang your new twine wreath ornament on your Christmas tree or wrap up to give as a handmade gift! Who would you gift this Twine Wreath Ornament to this year? Pin this post to your Christmas Board!